Given the extended period of counterinsurgency operations by the US military since the invasion of Iraq in 2003, it is understandable that other recent episodes of dealing with large insurgencies are of current interest. The German experiences in fighting partisans in both the Soviet Union and Yugoslavia are no exception to that interest, for what can be productively learned by current Western forces, for clarifying exactly what German Security operations in WW2 consisted of and how different those operations might have been from previous behavior. This book is primarily a study of what pre-WW2 German counter-insurgency theory was and how that manifested itself in 1944 doctrine based on 3 years of counter-insurgency experience. That gives the book a “what can Western forces learn?”, theoretical focus rather than being a more nuts and bolts, “here’s how they actually did things” study. The divided into 5 parts: a brief nine page introduction, a translation of the most prominent German interwar theoretical work on counter-insurgency (“Kleinkrieg: Lessons from the Past and Possibilities of the Future” by Arthur Ehrhardt), a 17 page overview of Operation White in Yugoslavia conducted January-March 1943, a translation of a May 1944 OKW doctrinal pamphlet on “Fighting the Guerrilla Bands”, and finally, a seven page overview of post-war German thinking on counterinsurgency. 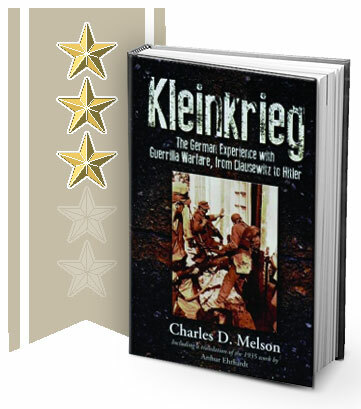 While the translations of Kleinkrieg and Fighting the Guerrilla Bands are useful and do provide context to German Security operations, I had hoped for more material showing how the pre-war theory manifested itself in early operations and how experiences in those operations had resulted in doctrine. This is heavy on the theory, light on the practice. So if you are buying the book for the translations, I think that’s a valid and good reason to get it. However, I was disappointed by the other material in the book, as I was hoping for a more in depth treatment of the practice of German Security operations. I’m glad I picked it up, but wanted more, which I’ll have to go hunting for based on the sources cited in the book. I give it 3 stars.